Here is our review of the Remington MB4040 that is a popular mustache and beard trimmer. It has 3 blades and 9 shaving settings. The blades are titanium and actually sharpen themselves. Incredible unit for the price! In a hurry ? >> See the best price on amazon for the Mb4040. My dear old grand-dad used to say that he never understood why a man would want to have hair all over his face. Mind you, he was country born-n-bred, and in those days men had big beards coupled with what looked like unsightly hair that seemed to grow out of everywhere. Personal grooming wasn’t so much an issue it seems, or maybe they just didn’t have the right tools to get the job done. Nowadays, it tends to be a different story. Even stubble-clad men tend to have their whiskers finely shaped and sculpted, whereas the majority of us just want to get rid of it, although we find shaving to be something of a real chore when we could be off doing something else. There are also times when things get too hectic at work or in our personal lives for us to actually set aside some grooming time, and something as simple as trimming our facial hair or shaving our beards becomes a burden. However, in my quest to rid myself of the beastly growth, I have found that the Remington MB4040 addresses these concerns with speed and ease. Remington has mastered the art of grooming and offers an extensive menu of groomers, trimmers, electric shavers and other accessories not just for men, but women as well. The men’s line comes with all tools imaginable, because Remington understands that grooming is really a personal matter. This is why they have all kinds of products fit for different people to choose from. The Remington beard trimmer that they have available is an offer that gives you great value for money, not only because it has the functionality that you need, but also because it is very affordable. Low-maintenance blades – Blades are a very important part of any trimmer or groomer, because at the end of the day, the blade is what gets the job done. With Remington, you get titanium-coated blades that are optimized for a durable and longer lasting performance. You also get self-sharpening blades that allow you to cut with impressive precision. You also won’t ever need oil, because the blades are permanently lubricated. The best of both worlds – When it comes to beard trimming, you have the option of going full-size, or really using the blade to trim regularly to maintain your look. But there are also times when you need a detail cutting blade, because there are finer details and shapes that you can’t accomplish with a full-size blade. With the Remington Detail Beard & Goatee Trimmer, you get the lot. Portability – It’s often difficult to grasp how so much power and functionality can come from something so small, and this is the case with the Remington beard trimmer. It’s very portable, small, and quite easy to manage and handle, so you get to use it anywhere you want, anytime you need it. It’s also cordless so you can literally take it anywhere. It’s also important to check the pros and cons of each product before buying so that you make an informed decision. Fortunately, with the Remington beard trimmer, you get many benefits and just a few drawbacks. One of the biggest pros of the Remington Beard Trimmer is that it’s rechargeable. Compared to other beard trimmers that take AA batteries, with this one you get a rechargeable device that comes with an LED charge indicator light. This gives it a longer life, so you don’t have to worry about running out of battery. 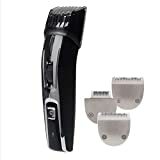 The revolutionary trimming technology that Remington Beard Trimmers come with is another positive that is keeping users happy. Imagine never having to oil your blades and not having to worry about lubrication at any point. This saves people a lot of time and also makes trimming so much easier, unlike many other trimmers that require you to think about when and how to add the oil just to have the blades functioning correctly. Another pro is the sleek and no-nonsense design which makes it very easy to use. You get none of the unnecessary trimmings, meaning that you just get what you need. One of the minor drawbacks of this product is that, because it gives you the most basic trimming functionality available, there are no other fancy features. It has none of the fancy technology you see with other trimmers. But it gets the job done so why complain? It comes down to personal preference of course, though many guys are not really keen on added technology anyway. That said, you do get 2 reversible combs and 4 trimming lengths for variety. Customers who want a no-nonsense, basic beard trimmer are singing the praises of this product. Remington is a name they trust, and most users who have tried the Remington Beard Trimmer are pretty satisfied with their purchase. Some are even saying that with this very portable and basic trimmer that they can throw in a bag and take anywhere, grooming themselves and looking good is practically in the palm of their hands…and their ladies are loving it! Users are also very happy about the value for money that this beard trimmer gives. While there are many fancy grooming tools available, some of them even made by Remington, there are those who really just want the basic trim. Should You Buy This Remington Beard Trimmer? When making your choice among grooming options, it always begins with knowing exactly what you want and expect from a trimmer. You should buy the Remington Beard Trimmer if what you want is something in your grooming kit that gives you a clean and easy shave. Remington knows how important it is for customers to be confident about the quality of the product or tool that they’re using, so aside from giving you a brand name you can trust, you also get a 2-year warranty with every purchase of a beard trimmer. Looking For the Best Price. Try Look On Amazon By Click Here For Discounted Prices. The bottom line with this product is that the Remington beard trimmer is simple, hassle-free, and way more affordable than most beard trimmers on the market. What more can you ask for?